I have been posting most of this material in another forum, but it has since been recommended to me to give this project its own Topic. This should help keep all the materials organized and presented on the first page, with each section being modified from development, playtest results, and feedback. And hopefully, a few additional eyes on the project to truly test it. 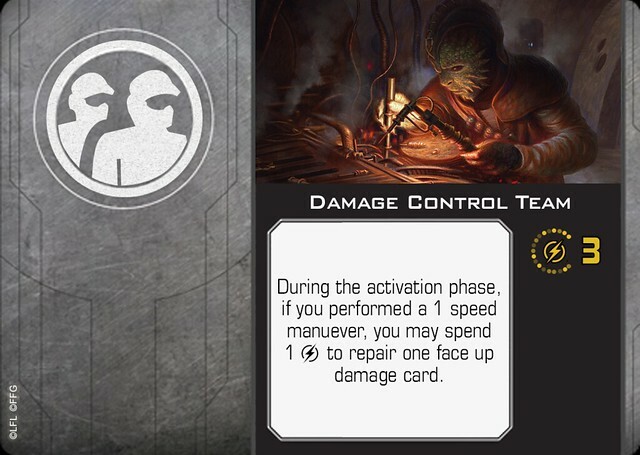 With FFG's 2.0 mantra of heavily regulated shield regeneration, there is an inherent danger in having a standard action for this very purpose. In addition, it is depended on the energy mechanic, which is no more. 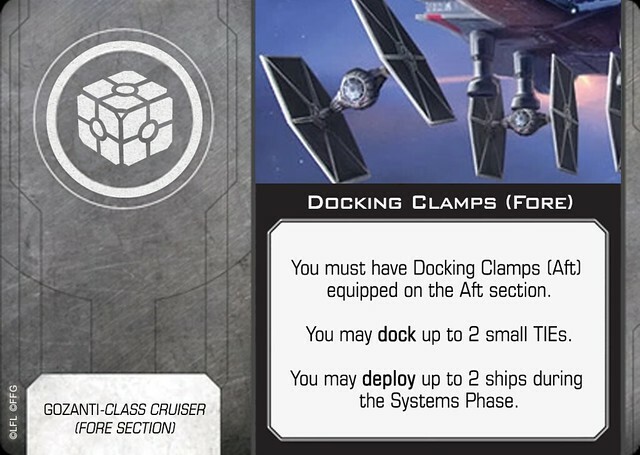 ALL Epic ships are getting two Ship Cards. Each ship card is treated as a separate ship in almost all cases, and we are truly exemplifying that in our current design. 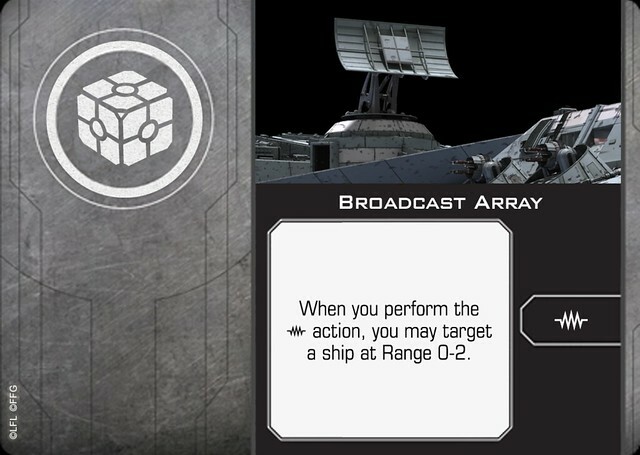 Each ship card activates separately, perform their actions in turn. Currently, we have eliminated the "Epic" portion of the activation phase, to streamline it more in to the 2.0 play experience. 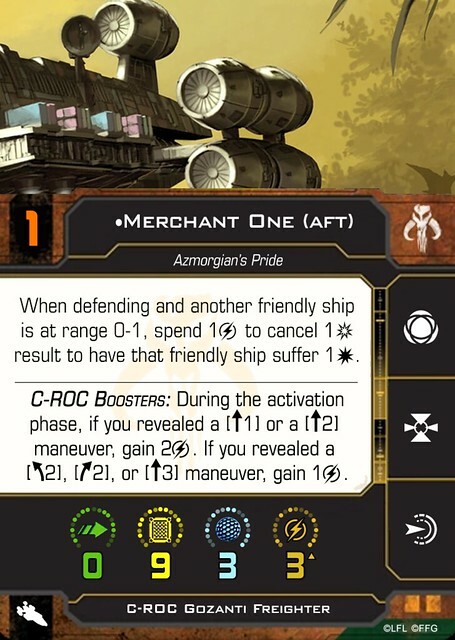 While they are not necessarily printed on the cards anymore, our approach to Epic is that Epic Ship upgrades and Standard Ship upgrades should NOT cross contaminate. By having these be universal in 1.0, it caused ALOT of headache (mostly crew cards). As Epic Ships and Standard ships should feel and play DIFFERENTLY, it makes the design space for balancing concerns much more difficult when they share options. As a result, Modifications and Crew will NOT be found on our Epic Ships. 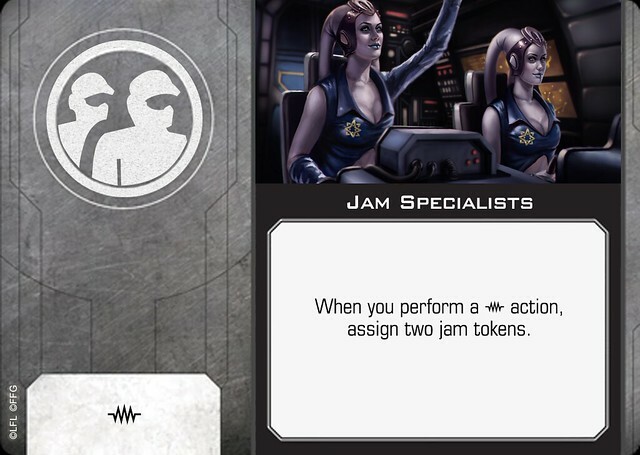 Instead, we have expanded the functions of Teams and Cargo, as well as added a new upgrade, Commander. 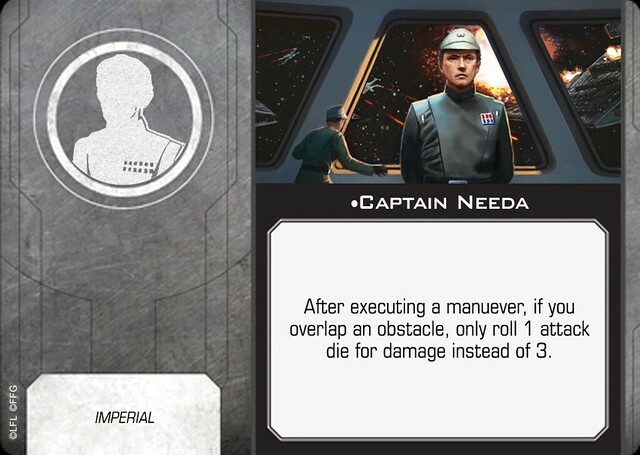 >>Teams have been used incorporate many of the generic (and some unique) crew options that work well for epic ships. >>Like teams, Cargo has been expanded, where many of the previous Modifications that were found for Huge ships are now here. >>The idea behind Commanders is that they should give Epic Ships 'Genre-breaking' abilities, with the thought that there is only 1 at most per Epic Ship. With the added rule in 2.0 that a ship can only every receive ONE bonus attack, regardless of source, we believe this should carry into Epic with an exception to Hard Points. 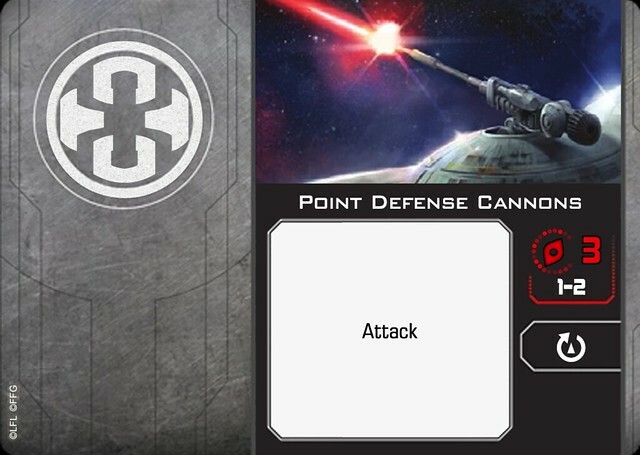 These grant additional attacks in addition to your Primary attack, but are not considered "bonus" attacks. 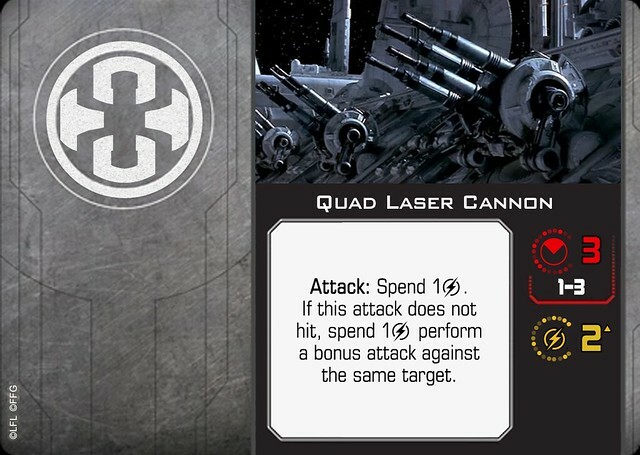 However, any additional attacks from these attacks (such as Quad Laser Cannon) still follow the rule of only ONE bonus attack per ship. 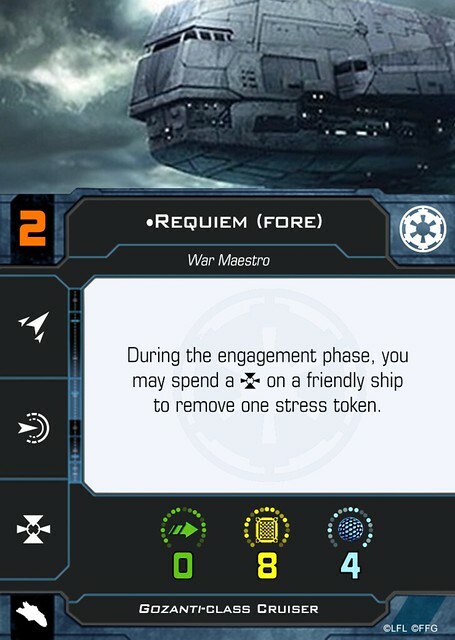 Note: As each Section is treated as a separate ship in the Engagement phase, each Section may perform a total of one bonus attack, granting an Epic Ship essentially two bonus attacks if utilized by each section. The Fore Section of the Epic Ship is considered to have performed (not revealed) a Blue Maneuver when it is activated during the Activation Phase. Each section may perform actions only on its native action bar. As free actions have been removed from 2.0, we see no reason to continue the functionality of Epic ships being unable to gain additional actions. 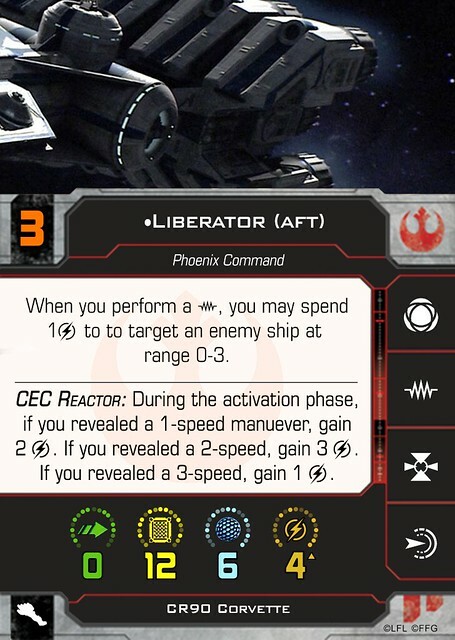 As many have stated and we agree with, action economy has become a huge thing in X-wing, and 2.0 is fully embracing this with controlled measures. As a result, we have incorporated many ways for Epic ships to gain additional actions. We have also added one new action to for Epic ships: Energize. >>Energize: When performing an Energize action, you may spend any number of [Charge] to regain an equal number of [Charge] on any number of your Pilot or Upgrade cards. For example: If you spend 2 charge from your Aft Section, you could either give one Upgrade two [Charge] OR your Fore Section and one upgrade one [Charge] each OR two upgrades one [Charge] each. >>Lock: Each section may acquire and spend locks with the appropriate action. Locks are not "shared" by each section. 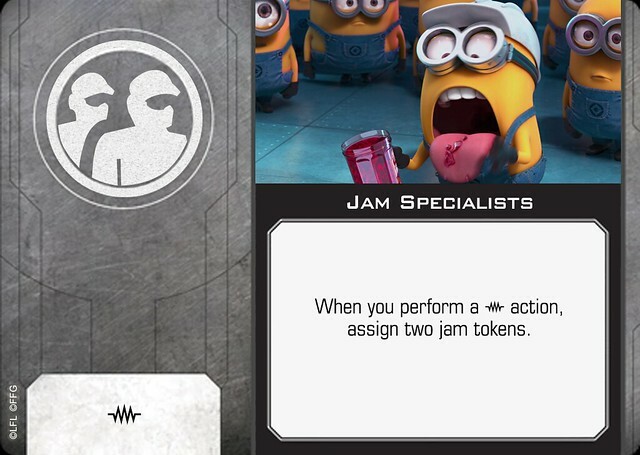 >>Jam: Now functions as it does it Standard Play for 2.0. >>Reinforce: functions nearly identical to Original Epic. 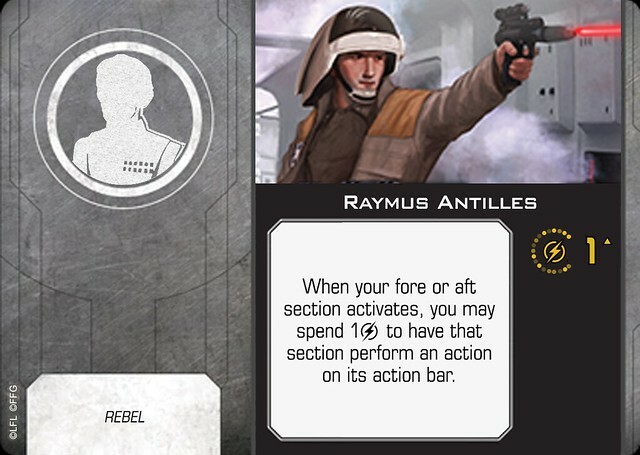 However, as I start to post the Pilot cards we have made, you will notice that EACH section has the Reinforce action. 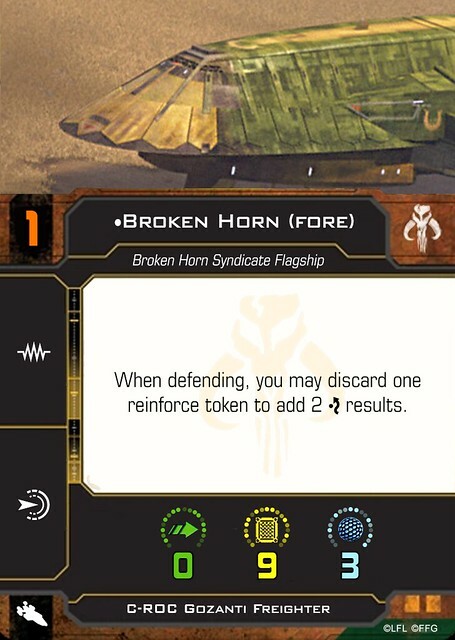 Whichever section performs the Reinforce Action receives the Reinforce token. It is possible for the entire Ship to be Reinforced if BOTH sections perform the action (As Reinforce has been limited to reducing damage to a minimum of 1, we feel this isn't overly powerful, while also providing a boost to the Epic ship feel and resiliency as Recover has been removed). We have altered the Epic Maneuver Tile to that attached. We have kept the 30 degree turns as the farthest that a turn can be performed by an Epic Ship, as we believe this adds to the large / heavy feel of an epic ship. All movement is now measured with the template lined up with the BACK edge of the Epic Ship. This Maneuver Tile removes nearly ALL of the 'fishtailing' effect that the old provided, and it removes level of need to move small ships out of the way (On a personal note: This is also much easier for Storage in my maneuver template case as it gets rid of the awkward shape!). Epic ships are no longer immune to stress. Epic ships now receive Ion tokens. 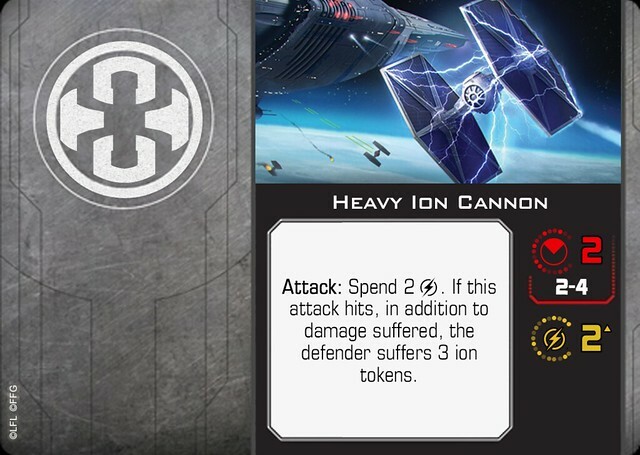 When both sections have acquired at least six Ion Tokens combined, the entire ship is considered Ionized, and suffers the effects listed in the 2.0 Rulebook. Epic ships are immune to the Tractor tokens and the 'Tractored Effect'. Epic ships can now gain Focus (and by extension Calculate), tokens. We share the opinion with many that we have read that Ramming should not destroy ships outright. However, we also believe that a Huge Ship should ALWAYS complete its maneuver. The current mechanic is inspired by Armada, but are still uncertain about it as it feels somewhat clunky. >>Overlapping Epic Ships: After executing a maneuver, if a Huge ship overlaps another Huge ship, use the standard rules for overlapping. However, overlapping an Huge Ship does not cause you to skip the "Perform Actions" step. 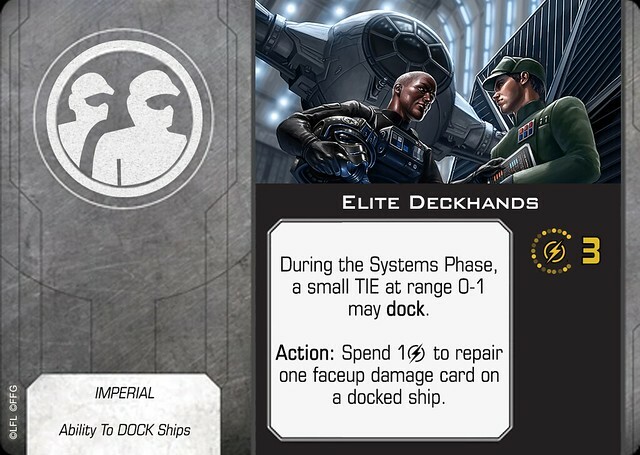 Instead, EACH ship are dealt a faceup damage card. >>Overlapping Standard Ships: If a Huge ship overlaps a Large, Medium, or Small ship, the overlapped ship(s) position(s) are adjusted by the controller of the Huge ship to allow the Huge ship to complete its maneuver. Ships adjusted in this way must still be in contact with the Huge ship as well as their previous position (if their previous position is completely covered, the Epic Ship controller moves them to as close as possible to their previous position while still in contact with the Epic Ship). After their position is adjusted, the opposing player to the huge ship’s controller may adjust the standard ship’s facing to any direction. 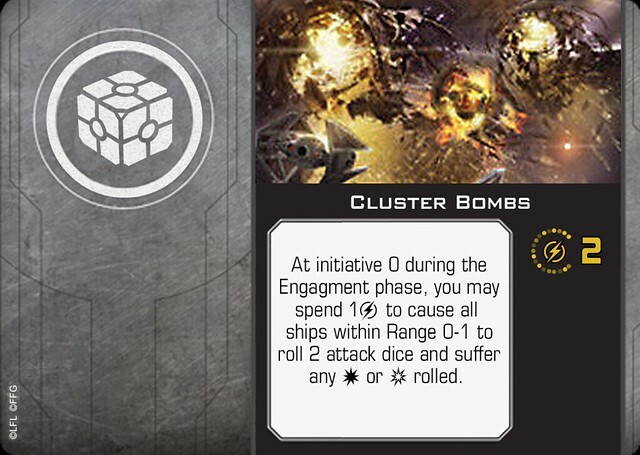 Standard ships then suffer a number of facedown damage cards based on their size, Small - 4; Medium - 3; Large - 2. 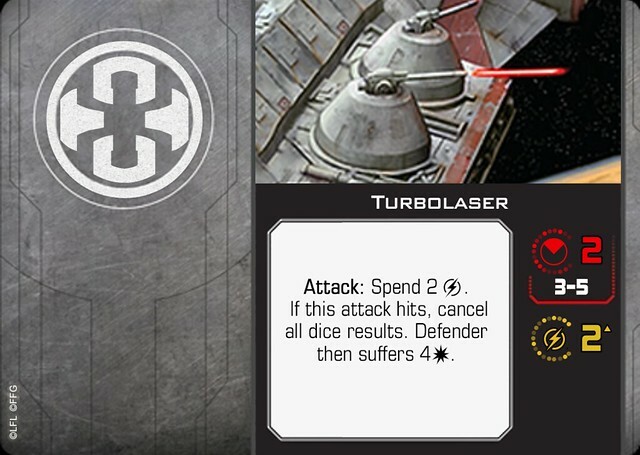 The Huge ship also rolls 1 attack die, and suffers any hits or critical effects rolled. Overlapping a Standard ship does not cause the Huge ship to skip the "Perform Actions" step. >>Overlapping Obstacles: If an Epic ship overlaps an obstacle, it rolls 3 attack dice and suffers any damage or critical damage rolled. Then remove the obstacle. Overlapping a Obstacles does not cause the Epic Ship to skip the "Perform Actions" step. >>Standard Ships Overlapping Epic Ships: When a standard ship overlaps a basic ship, it follows the standard rules for Overlapping ships. In addition, the player controlling the overlapping ship rolls 1 attack die, and suffers any damage or critical damage rolled. Huge ships have three sets of firing arcs printed on their ship token, Fore Section Firing Arcs, Aft Secion Firing Arcs, and a Shared Firing Arcs. Primary weapons and special weapons that utilize an arc utilize the arc of the section they are found, unless the weapon has the shard firing arc symbol printed on it. 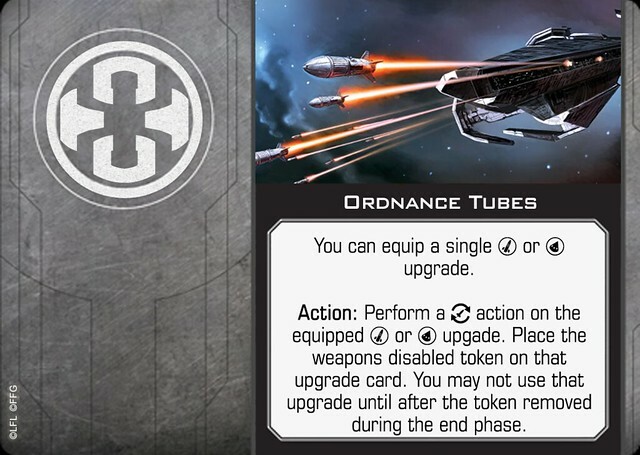 Weapons with the shared arc symbol must use the shared firing arc set on the huge ship token. My gaming group here in the desert have been looking at how to adopt Epic into 2.0 since FFG performed the unboxing of the conversion kits. We have done quite a bit of work playing with a custom redesign that hopefully has a similar feel to 2.0. We are attempting to approach this from a similar stance to how the Devs have stated in their many videos, with one of the biggest being that we aren't worrying about points cost until everything else feels right (not too mention there are still a LOT of point cost variables that have yet to be seen). (EDIT: Points have been posted as well, though in a very rough form. Card abilities and interactions are still first priority, but these points are guidelines in hope to encourage more players to try this stuff out in the wider world). >>Proposed Change 2: Reduce range to "0-3" or "0-2"
>>Proposed Change 3: Grant recurring ability to charges. Add text that upgrade cannot gain additional charges from other sources (such as Energize action). >>Proposed Change 4: Reduce to 1 or 2 Charges, alter ability to use 1 charge. Add text that charges cannot be restored. >>>>Concern: Rieekan should NOT be every turn, ever, unless great amount of resources given. No mechanic should exist for ability to kick off every turn, should be difficult for every other turn. >>>>Note: Points Cost will be readdressed upon any change made. >>Needs to be brought back to drawing board. >>>>Latest interview with Dev again points to reigning in action economy in a controlled manner. 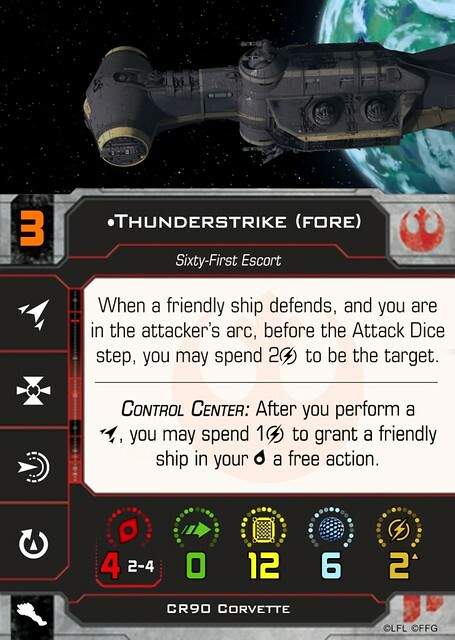 This card is essential Push the Limit for Epic ships, and has become almost too essential to every build. 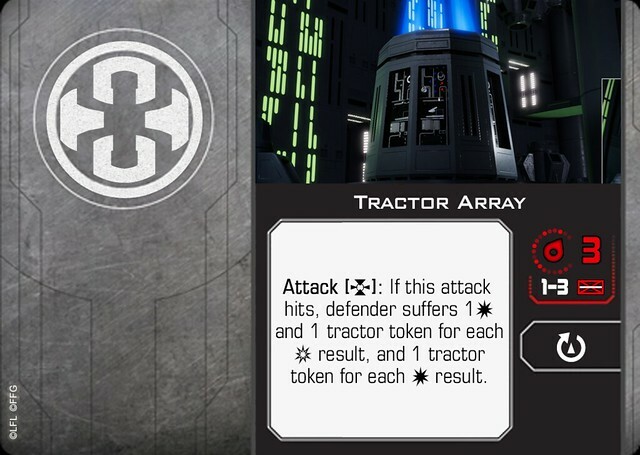 >>Change Text to "Attack [L]: If this attack hits, instead of damage, for each uncancelled [d] result the defender suffers 1 tractor token, and for each uncancelled [c] result suffers 1 tractor token and 1 [d]." >>Increase Stat to 2 [Charge], Recurring. 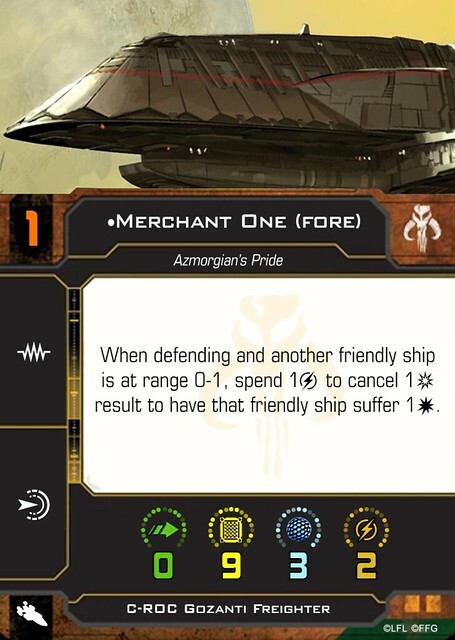 >>Change Text: At the start of the Activation Phase, you may spend 2[charge] to select another friendly ship with Range 0-2. That friendly ship's Initiative is reduced to match an initiative to that of a friendly ship within Range 0-2 until the end of the phase. You cannot increase a ship's initiative with this ability. >>Clarification on Turret Arc action with Shared Arcs. >>Deal Double Damage to both ships?? >>Change ability from repair damage to Recharge abilities? 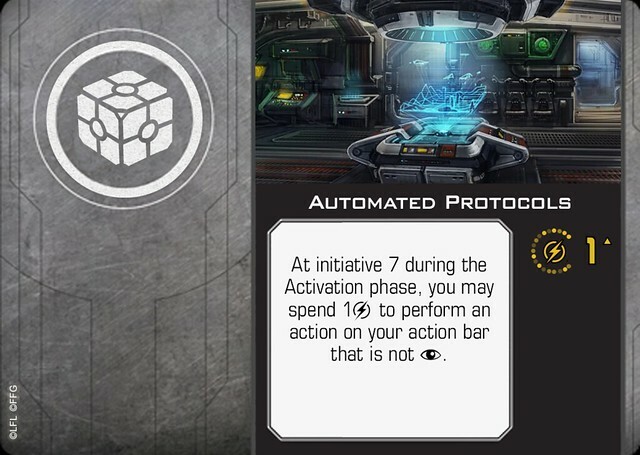 >>Change Text: CEC Reactor: During the activation phase, if you revealed a 2-speed maneuver, gain 2 [Charge]. If you revealed a [1S] or [3S], gain 1 [Charge]. 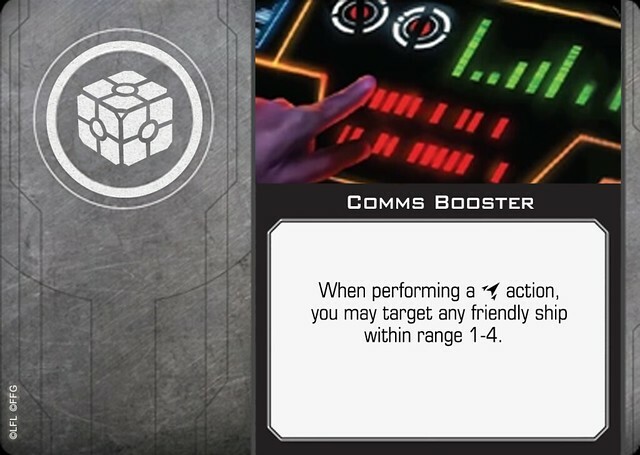 >>Change Text: Control Center: When you perform a [Coordinate], you may select to up to 2 friendly ships in your same arc. >>Give Title ability 1[Charge] Cost. >>Change Title Ability to match Liberator (Fore). 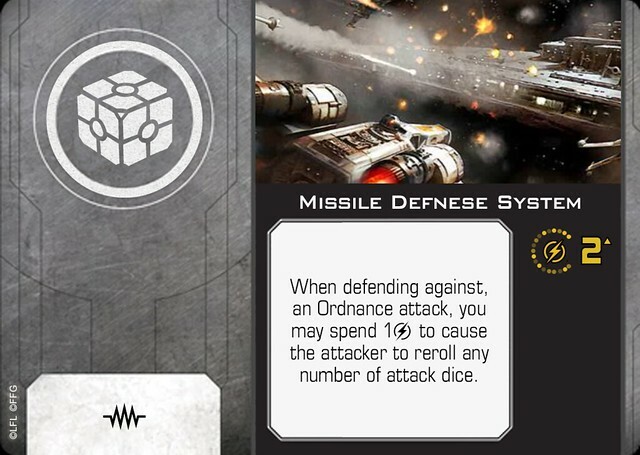 >>Change Text: "When defending against a [Missile] or [Torpedo] attack, you may spend 1 [Charge] to cause the attacker to reroll any number of attack dice." Need to learn how to spell Maneuver. >>Range from Huge ships are measured from individual sections, not the entire Ship tile. Convert all 5 Epic Vessels to 2.0 style format. Average 3 Commanders per Ship. Convert all viable upgrades from 1.0, in spirit or function. 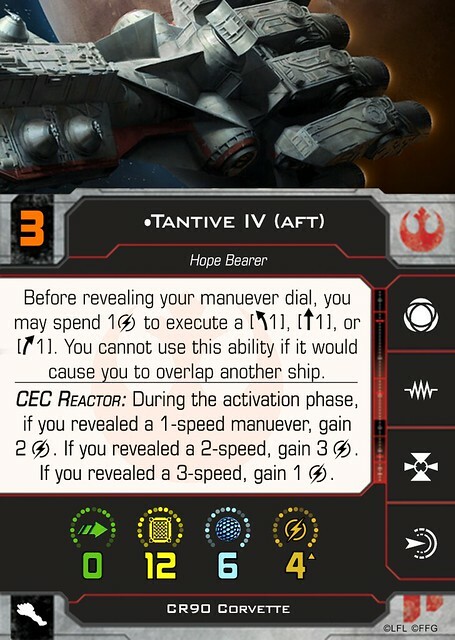 >>Is the new mechanic streamlined with the Standard play of X-wing, or is it too intricate / involved? If yes, then its back to step 2 or drawing board. Now that most of the heavy lifting is out of the way. Above is the version of 2.0 my humble gaming group has been working on for some time. I'd also like to shout out to @pickirk01, @Tervlon, and @FiFTy FooT FoX for their initial help and support at the other topic. All of this stuff is here for playtest, development, and opinions. We also have a lot more in the works, and are working to get as much done on this as we can as quickly as we can. With that said, we unfortunately cannot play test every day, or even every week. Not to mention our pool of players is small compared to what's out there (we hope). We are putting this here in hopes to have more development, ideas, criticisms, and opinions to fuel the fire to forge this game. If you don't agree with what we have, please tell us, so we can test it. We invite criticism and critique, but please make it constructive. The posts prior to this one are intended to be kept up to date with the newest stuff, so that way as testing and development adds and/or changes items, these will get changed as well. To reiterate the points issue, we aren't really looking at points. Our playtests here have been more along the lines of "is this worth as much as this ability" or "is this as good as this ship". We have been utilizing a mixture of 1.0 and 2.0 to get close enough, but the main priority is checking if the ships feel right and if they feel they can handle against an appropriate amount of opponents. We will be looking closer at points once the FFG app is out, and the standard points are released. Thank you in advanced for any effort you can give in helping adjust Epic to 2.0. 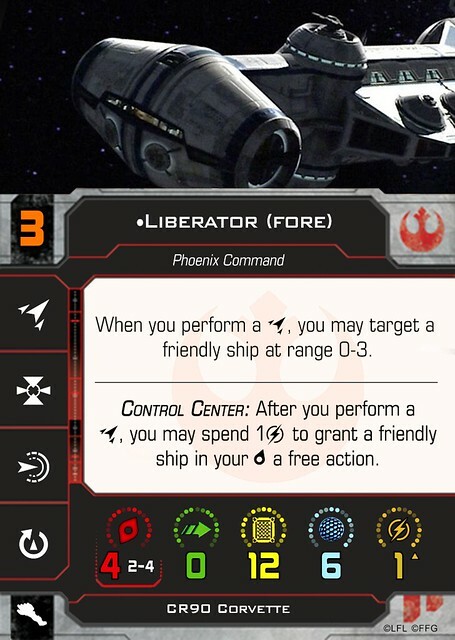 Liberator aft has the typo "to to." Primary weapons changes - In your play testing, what were you finding that made you change the CR-90 range from 3-5 down to 2-4 and also make the Raider primary have the Attack (Target Lock): header instead of choosing any target? Charges - Each ship section has a charge value to it. Will you only be allowed to spend charges from that section to power upgrades equipped to that section? Or can the charges be used anywhere on the ship and the separation was more to balance things if one section gets disabled? Thanks for the typo catch on the Liberator. Yeah, I'm almost embarrassed by that dial. Will fix that here momentarily. Their were a few reasons to reducing the CR-90 range. On the fluff side, the Raider should be the Military Warship of all 5. It should have the most teeth, and the most range. The CR90, while capable, is more of an all purpose vessel. 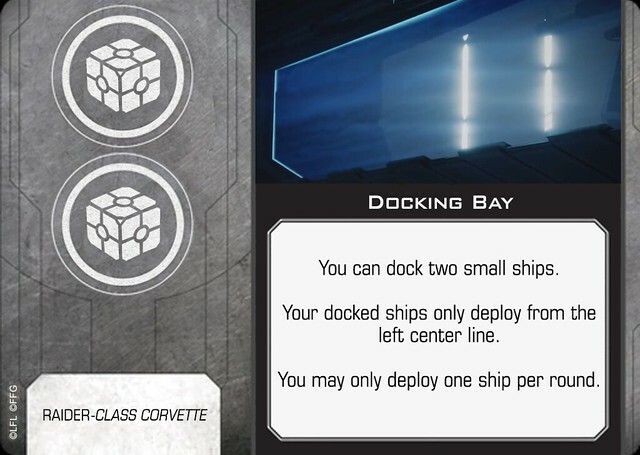 The other side, we found Range 5 to be very dangerous in 2.0 for 4 attack dice with all of the dice modification that these ships are now able to get, and only a single range bonus (we do NOT want to go back to the way it was originally in 1.0. Range 4 and 5 were essentially worthless, or Range 3 would be too deadly). Because of these two things, we realized that we should either up the Raider to Range 5, or decrease the CR90 to Range 4. Also, it's hard to escape that massive cross section of space at range 5, and 2.0 is really emphasizing flying your ships versus inescapable arcs. Ultimately, we agreed Range 5 should be extremely rare (right now it is just the Turbolaser). The other thing is we are and have been since we first started the CR90, we have been working on a Turret style upgrade for it that may turn any one Hard Point into a single arc turret. Still working out its possible viability, but it could give the CR90 that range 5 shot again, but with the restrictions inherent in the Turbolaser that shouldn't be given to a Primary Weapon. That symbol on the Raider is the new Shared Arc symbol, though none of us caught its similar look to the Target Lock. It is just signalling to use the middle set of arcs on the ship tile (which is explained in the Epic Rules we linked to up top). Charges at their base level function just like they do in 2.0 standard. What lets you move them from your ship card to other cards is the Energize action. Right now, as a default, only the Aft sections of each of the ships have that action, and are the portion of the ship that get bonus charges based on the maneuver revealed. 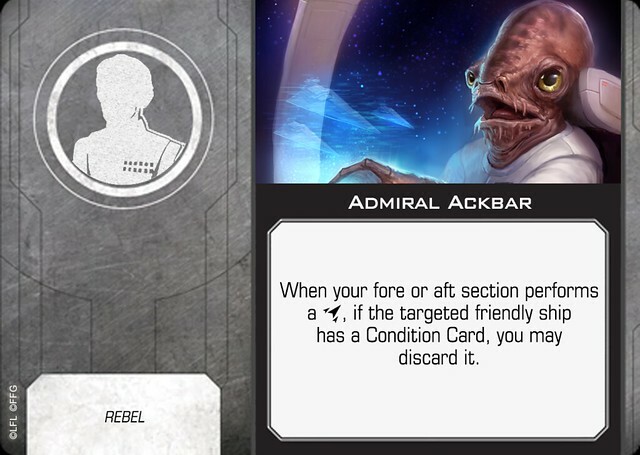 And as the action is described above and in the epic rule pages linked, when taken, you can move energy to any upgrade card on either ship card, or to the other ship card. Please let me know if the rule book portion on this needs to be clearer. We tried to make it clean and simple, but there are some among us who are... verbose. Thanks for all this effort and more importantly, thanks for sharing it! Nice work on the cards and dials. I think the rules will need to undergo a few revision though. On energy (now called charges) the dial should remove charges to reflect on how different maneuvers may have engine strain. I don't see a need to change the epic maneuver tool. Fishtailing does make the huge ships seem that much more lumbering. Some new maneuvers using the old tool should be made to open up the dial and movement profiles for all ships. 2.0 doesn't stick with the original 26 maneuvers from 1st edition but also includes the 12 maneuvers that have been created from Wave 3 and beyond. I really think we should make new moves for huge ships other than the 8 maneuvers they currently have (Obliques could work. They are like huge banks but they don't turn the ship just shift it diagonally). The Dial should have blips but the blips should be how much energy is taken away from reserves. The energy step should be like the activation step. Distribute Charges to systems (upgrades ect). I don't think Huge ships need bullseye arcs, I don't see any star wars ship like the Anime Starship Yamatto with a waveform cannon. Bullseye is more for fighters. An Iowa Class Battleship doesn't have most of the firepower on it's front neither does a Zumwalt class destroyer. Sections can be nice you could use them for targeted damage (like assigning ion tokens to a weapon instead of the ship itself disabling it). I know 2nd edition is to be the antithesis of shield regeneration but I don't think removing recover action from huge ships is the best way to fit it into 2.0. I do think it can be drastically reduced in power. You can have the recover action but instead of recovering shields for the entire ship only for a section. 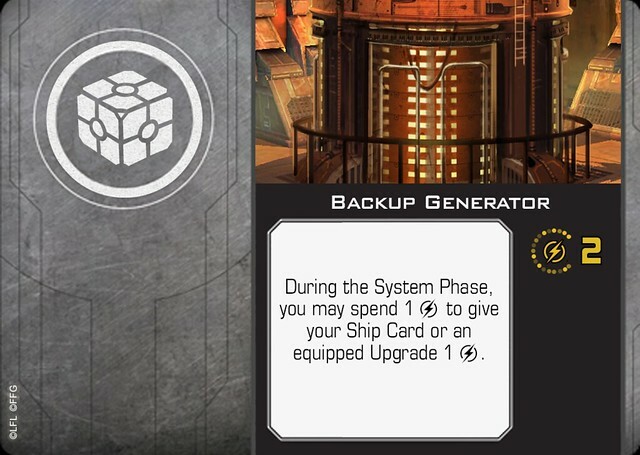 You will still be required to expend all energy from your ship reserve and all upgrade cards attached to that section (moving energy from weapons to shield). Since it is only one section it isn't a full recovery and the charge cost is still prohibitively expensive. 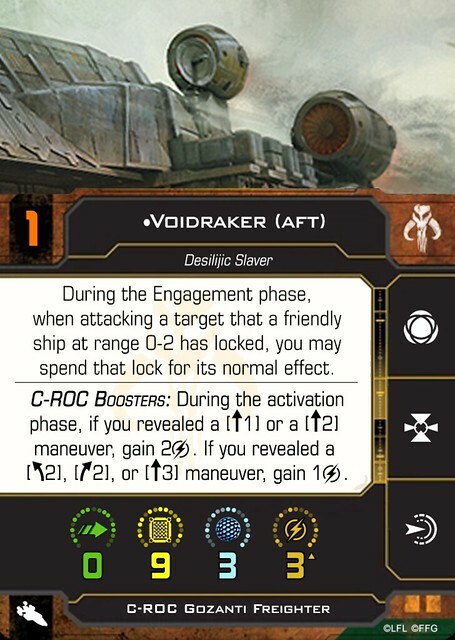 That being said the single card ships (GR-75, C-ROC, Gozanti) should probably be 2 section cards. As we had guessed (it's why it's the first change listed), this appears to be the one of the main sticking points in the beginning for a lot of older Epic players, though to a greater degree than we thought. As it lead to a few heated discussions within us before arriving to what we have, let's see if we can help clarify the why and prevent these types of discussions going into ad nauseam territory. Please note, if you see a flaw in our way of thinking or design, please let us know. And when you do so, please provide examples and reasons for it. First, it is replaced. Not reskinned as a charge mechanic, and we did not retool the charge mechanic to be like the energy mechanic in first edition. The energy mechanic is gone, removed from the system. We had a few reasons for doing this, and it ultimately came down to our list of flaws in Epic 1.0 Design, and what we felt the Energy Mechanic was attempting to do. In First Edition, there never appeared to be enough energy. This was obviously a flaw in the first release of Epic, as ships originally started with 0 energy. Then, at the first or second tournament faq (rules still don't indicate either way), it was stated that Epic Vessels and Upgrades started with FULL energy. While this maintained for a while, and Epic Ship still become mostly either an large Alpha Attack ship in many cases, or it did everything it could to stay alive and its weapons did little. By utilizing the Charge mechanic, as it is described in 2.0, it immediately removes the confusion. But before we get lost in the weeds of a wall of text, lets break down how the Energy Mechanic worked, and what we believe it was attempting to do. provided a system for Epic Ships to attack multiple times, but in a controlled fashion. linked weapons and some abilities to its speed, reducing the availability of some of these actions, providing hard choices on what to take. as some actions, weapons, and abilities were linked to energy, provided a way for Ion effects and others to disable a Epic Ship, as the normal Ion rules did little to affect it. This is also needed as Stress is a non-factor for epic ships. failed to be enough when having multiple upgrades. Prevented multiple styles of build options, leading into greater points being wasted. ,with dependent abilities such as Recover, gave to a sine wave of gameplay, where ship was either useless or fully dangerous. When building our version of Epic 2.0, we looked at through the lens of "Let's start with the 2.0 rules, and see if we can build a place for Epic within them". We did not want to simply "port" Epic 1.0 into 2.0, as we felt that was self defeating as Epic is far from a solid system. With that, we set ourselves up with a set of rules for building new mechanics (see first post). Anything that was in Epic that was not in 2.0 was viewed as a new mechanic. So let's break down how addressed the above items. 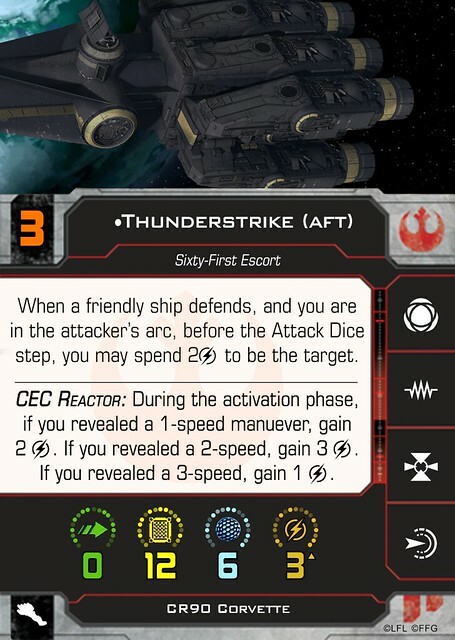 Attack Multiple Times: In Standard 2.0, ships are restricted to a single additional attack per round (stated by Devs during unboxing video). By giving Hardpoints an exception to this rule, similar to there place in Epic 1.0, it allows for epic ships to attack multiple times. 1a. Controlled. With the charge mechanic (an already established 2.0 mechanic), we can have weapons take x charges, and recharge at a slow rate, or not recharge at all, controlling the availability of these weapons and abilities through the course of combat. Linked Speed to Energy. 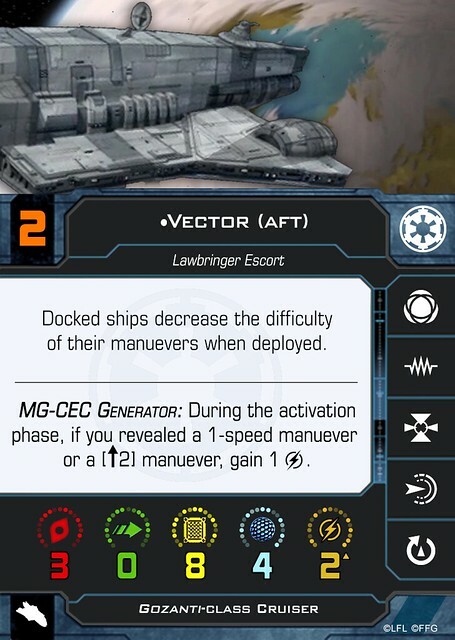 With the Charge mechanic being similar to the Energy ability in many ways, we can have the ships gain bonus charges based on speed as a ship ability (another already established space in 2.0). 2a. Ability Availability. Linking the charge mechanic in 2.0 to recharging abilities required a new ability or mechanic of some sort. As action economy is important, we felt that creating a new Action for Epic Ships, that allowed movement of charges, filled the roll of recharging abilities, at the sacrifice of an important resource (your action). Ion effects. 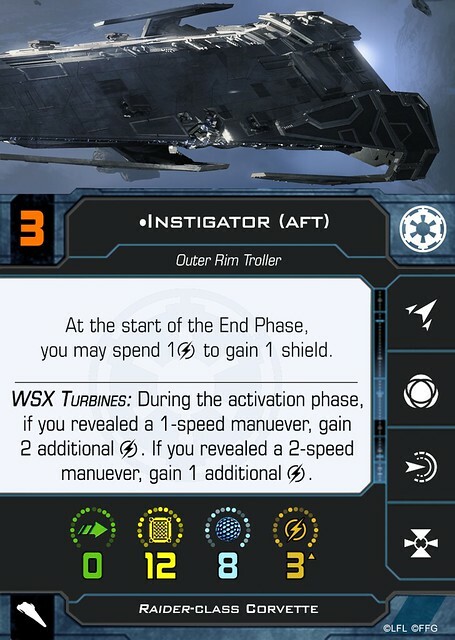 With the new Ion Rules (non-revealed blue 1 straight maneuver and no action can be taken except focus) , this already greatly affects an Epic ship. 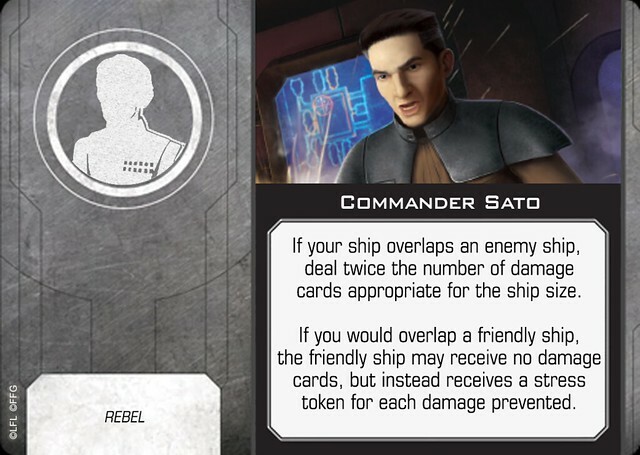 With the ship ability being dependent on a revealed maneuver, the ship cannot gain bonus charges. 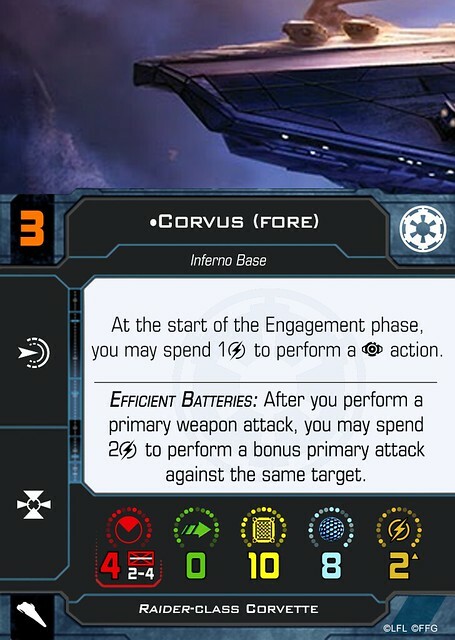 As epic ships typically do not have the focus action (current exception from the Tarkin upgrade), this denies epic ships of their actions, and most importantly, ALWAY denies them the energize action, diminishing their ability to recharge their weapons / upgrades. And since this allows Epic to streamline more easily into 2.0, it is a definite plus. 3a. 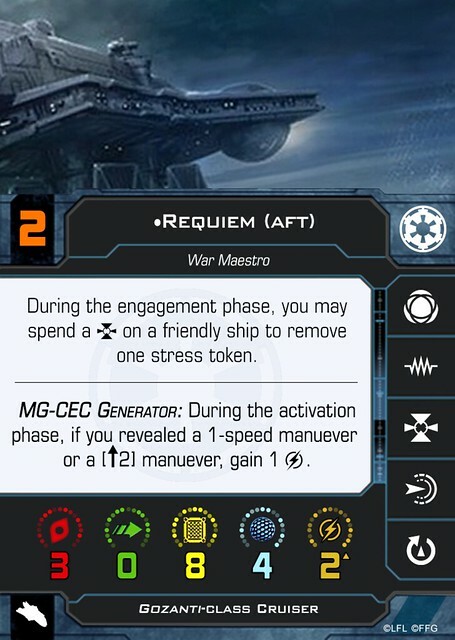 Hurting epic ships with energy denial: As epic ships are no longer immune to stress, and the economy of charges being dependent on a action (see above), this becomes a non-factor, as epic ships can be affected in multiple ways that is still within the 2.0 system. With the charge mechanic, we can have multiple upgrades have their own trickle charge system, allowing for upgrades to be useful throughout the game. This allows for a greater diversity in Epic Builds, as well as making Epic Ships worth the resources (points) you put in them, if they took a lot of resources to build. Since many upgrades are psuedo-independent, and by removing abilities such as recover (more on that in the next post), Epic ships become less sine-wave like in game play, and much more consistent throughout the game. As epic ships are huge, center pieces of your small fleets, they should be the consistent rock that contrasts against the dynamic dog-fighters found in the smaller, standard ships. And by it being consistent, the ship is always dangerous, which epic ships should be. Fishtailing does make the huge ships seem that much more lumbering. I have heard this a couple of times, and politely disagree. The restriction to the 30 degree arc makes them lumbering in our opinion. In Star Wars, physics in a vacuum as we understand in the real world does not exist. Starfighters work similar to in atmosphere aircraft, and capital ships work in a realm that mixes large air craft with naval craft. In naval craft, if a ship has meaningful forward motion, and its source of propulsion is not attached to the rudder, a ship's aft-port corner never crosses, in a meaningful way, the imaginary line created by the port side at its starting position when turning starboard. As these ship battles appear to nearly always assume a forward motion, we removed the fishtailing. Also, the new template is simpler and easier to use in our opinion. However, I do understand and can appreciate thinking towards the original. None of the systems that we have developed are dependent on the new template, so can be compatible with either one. I find this comment somewhat misleading. 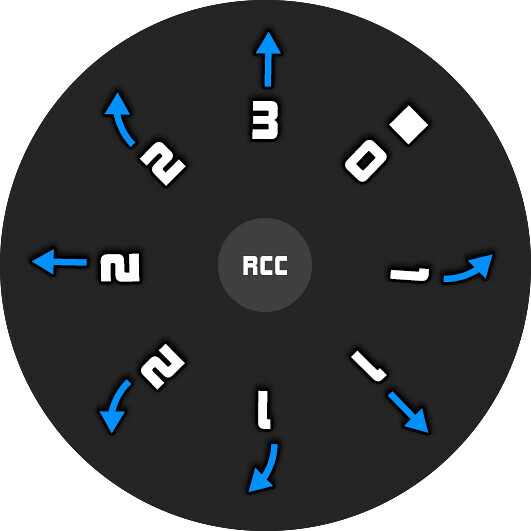 With the exception of the Stop maneuver, and the the three reverse maneuvers on the Quadjumper, the other maneuvers added are a re-purposing of existing maneuvers to give a 180 turn effect. and even those utilize existing templates (and your division is off, 22 / 16, with the assumption all five straight's are K-turn possible, which was actually indicated against originally on first release). In any respect, we did start playing with adding a 5 straight and 3 turn, and as we start to dive more into dial diversity, we are looking at doing that again. Those with the stop maneuver would increase the Epic options from their original 8 to 12. This would grant further possibilities in design space, and would be easily added with the new the maneuver template (but not with the old). Though your oblique maneuver idea could be interesting in giving greater options to Epic ships. How would you propose doing that with a maneuver template? The Dial should have blips but the blips should be how much energy is taken away from reserves.﻿﻿ The energy step should be like the activation step. See the above post about why the Energy Mechanic (and inherently the Energy Step) has been removed. We also find that an Epic Ship needed a resource mechanic to perform basic maneuvers would slow the game down considerably and add a level complexity unneeded for Epic Play. To be fair, we haven't come up with a use for them yet (though it may get used on the Raider, we'll see how playtesting goes). However, taking it away removes that option from the design space, and by having them, allows for a uniformed appearance and thought with 2.0 as a whole. In terms of the Anime Starship Yamatto in Star Wars, see EU Eclipse Class Star Destroyer Super Laser. I know 2nd edition is to be the antithesis of shield regeneration but I don't think removing recover action from huge ships is the best way to fit it into 2.0. I do think it can be drastically reduced in power. We agree that shield regeneration should still be a thing, but having an action dependent on a defunct mechanic wasn't going to work. 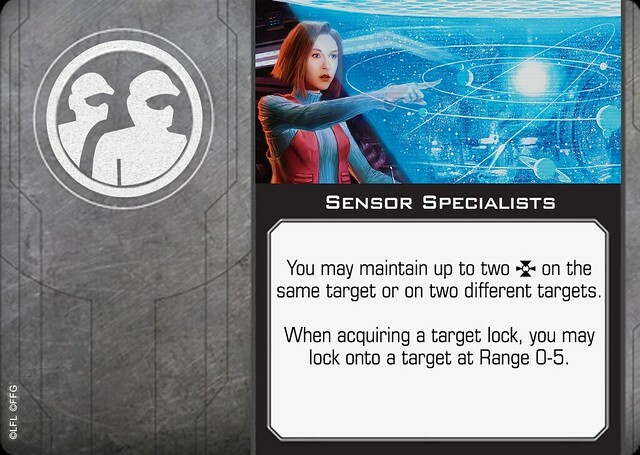 Plus, there is an inherent danger to having a shield regeneration as a standardized action. So it has been relegated to upgrade cards and title abilities. 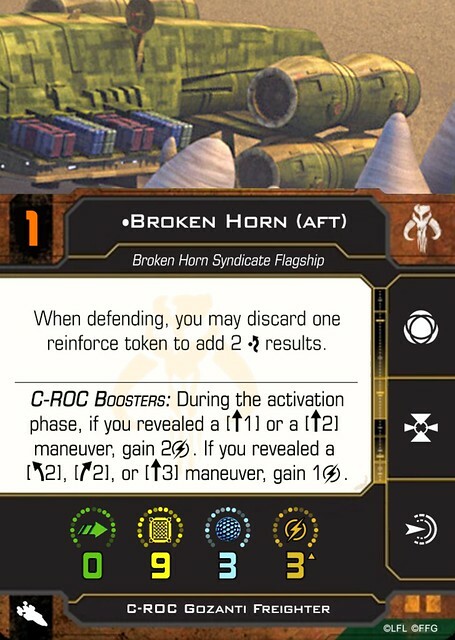 That being said the single card ships (GR-75, C-ROC, Gozanti) should probably be 2 section cards. 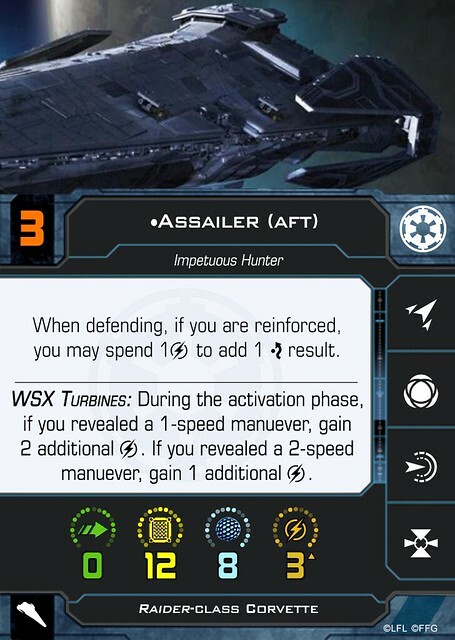 If you look at the post where it is labelled Ship Cards, you will see this is already to be the design. Believe me, I know that's alot of information to digest in the first few posts. I'll just use bullet points. Not trying to mislead, sure all 5 k turns were not on dials (and still are not) but that didn't make them impossible. 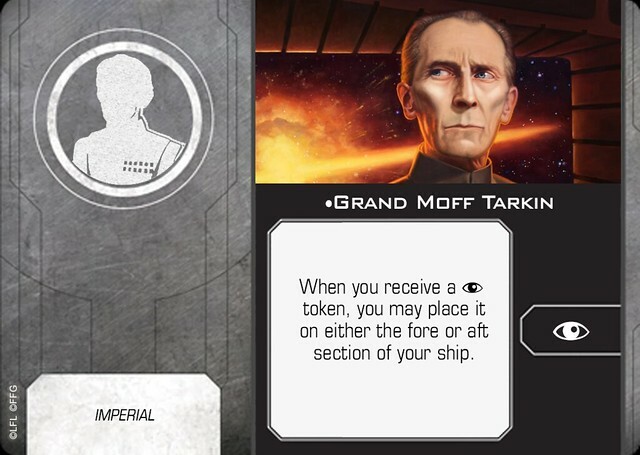 The templates were there and the rules were in place if FFG wanted to release a ship with a 1K turn they could. However I was talking about how they also took their templates they have made and figure out ways to make more creative moves with the S-loop and the T-roll and reverse maneuvers. Now for alternative huge ship maneuvers I did a whole thread you can see HERE. I won't go into all the different ideas for maneuver but I will try and explain the obliques even though it would kind of be hard without pictures. It is sort half way between a bank and a turn. You place the template inline with the back of the forward base as if you were going to make a bank but instead of fitting the notch around the corner you orient the template as if you were moving straight. You then simply move the ship to the opposite side of the template sliding it into the 1 or 2 bank depending on the speed of the oblique maneuver. No fishtailing but not exactly a turn. Think of it firing its lateral thrusters while still drifting (or burning) in a forward motion where a bank will be more of a yaw thruster firing pattern where the fore lateral thrusters fire in opposite of the aft lateral thrusters. This is one where we are just going to have to disagree. As we both know movement in x-wing is governed by stress control while for huge ships it is energy management. In 2.0 charges are effectively energy. There should be some refinement to the current system but scraping it all together doesn't sound good. 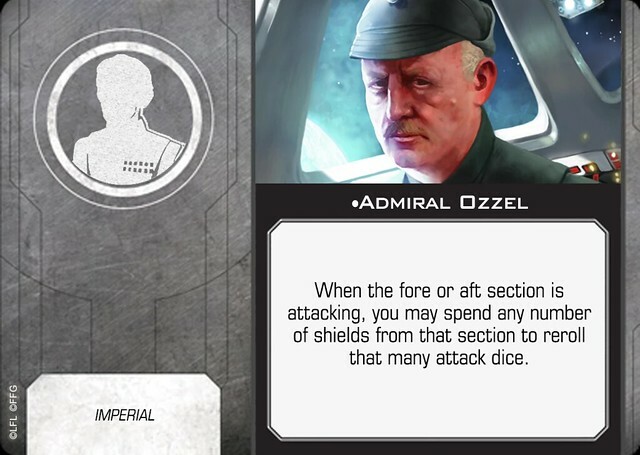 Also I don't think Huge ships should get focus tokens, now calculate, bring it on and it could help huge ships as for a while because of the lack of focus huge ship dice < other ship dice. But I do think that huge ship actions should reflect more on the actions of the crew working as a team instead of that of a pilot using their own initiative. Multiple sections means multiple actions, charges are their resource. Calculate can be placed to give huge ship some work around with focus results. And that is exactly why the forward bullseye arc should not be placed on these huge ships as they are. 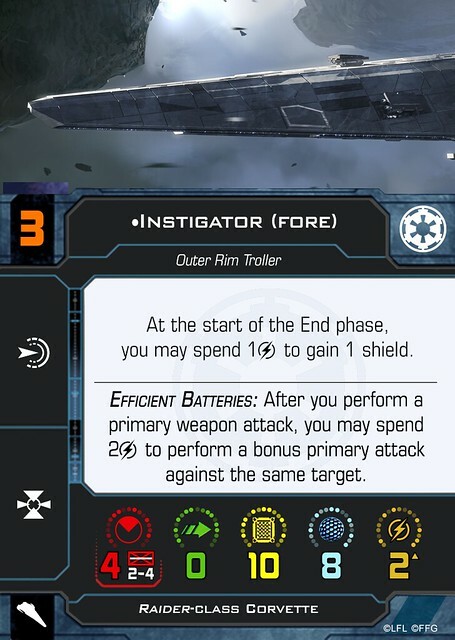 Sure the Eclipse Star Destroyer has a fixed forward mounted weapon (and people call me crazy for wanting an Imperial Star Destroyer in X-wing epic) but with 2.0 they already had a place for bullseye arcs. There could be some sort of focused arc but maybe forward is not the best place for them. I could see 2 "bullseye" arcs off the port and starboard sides and the midriff as some sort of concentration zone/weakspot but a forward firing just like a TIE fighter or YT-1300 doesn't seem to fit. I wouldn't call the mechanic defunct, unless you mean defunct by your rules which scrapped the energy cycle which I would say lay even more credence into you needing to revisit that decision. 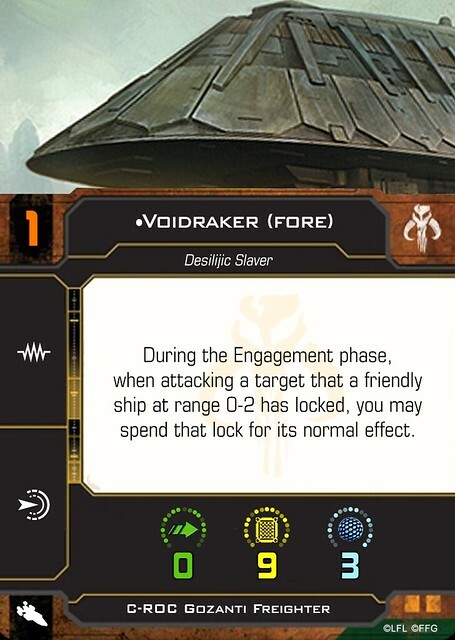 As for the inherent danger sure which is why instead of throwing it out with the energy/charge step it should be focused more on a section or something instead of just gaining shields for the entire ship. Something to be placing more energy into either the front or the rear shields to make them more resilient to the attack instead of just giving all shields until you reach max or are out of energy. This measure seems to be in line with 2.0 in not removing regeneration but making it less potent than what it used to be. I see you used plural form in mentioning these items. I was just reaffirming something that I said in an earlier post. I still want to say the cards look great good work with the strange eons plug. 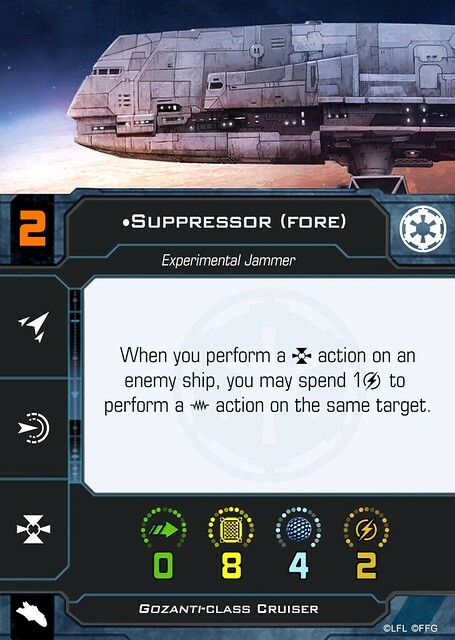 Using the ship ability as the energy step is an interesting idea but I think you might run into the problem of putting too many words on a single card (something I learned as an easy mistake when I made the scum GR-75 kit). I think having the reactor state how much energy to gain and a bonus stipulation to weapons or engines could go a way then have the dial take away some energy could be less prone to error. 2. 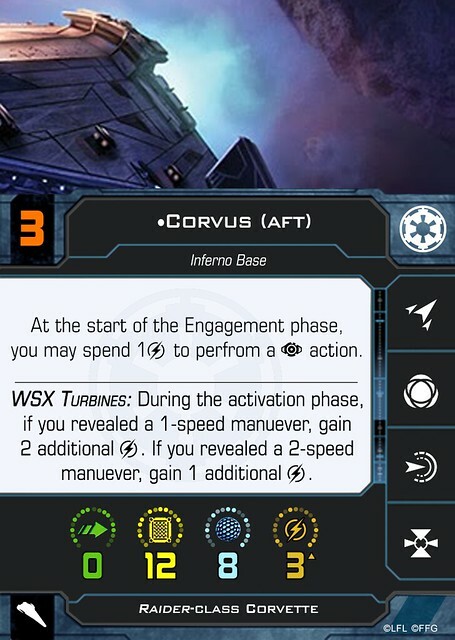 On your obliques, does this the mean the huge ship would be 'drifiting' the width of the thin part of the maneuver template? Are you removing almost all forward movement, just drifting sideways? If so, then there are more than a few concerns when it comes to the 'ramming' qualities and template use. 2a. Your ideas about adding additional layers of complexity with Ion pips or negative energy to an already complex movement system in Epic 1.0 defeats the objective to streamline the game into 2.0, adds additional barriers from bringing new players into the game, and slows gameplay which is already one of the great barriers in getting players to play Epic. 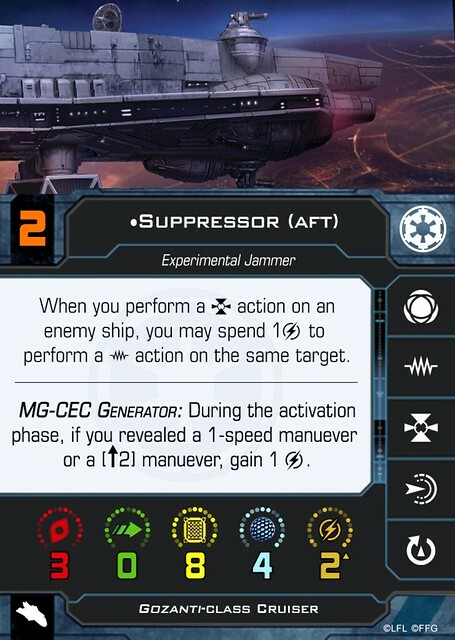 Our playtests also confirmed what many appear to have already voiced with 0 manuevers granting max energy, as well as the inherent dangers in granting epic ships a reverse maneuver. 3. Why does scraping it all together not sound good? If 2.0 charges are effectively energy, why not utilize the system developed for 2.0 (streamlines play, unifies the system, allows to address energy mechanic issues). 3a. We don't see the logic in giving calculate, but not focus, as two calculate are typically better than one focus and they serve an almost identical mechanic. Your arguments appear to be psuedo-fluff based from a restricted point of view, but teams in large environments akin to large ships that are able to focus better collectively perform better than other teams. 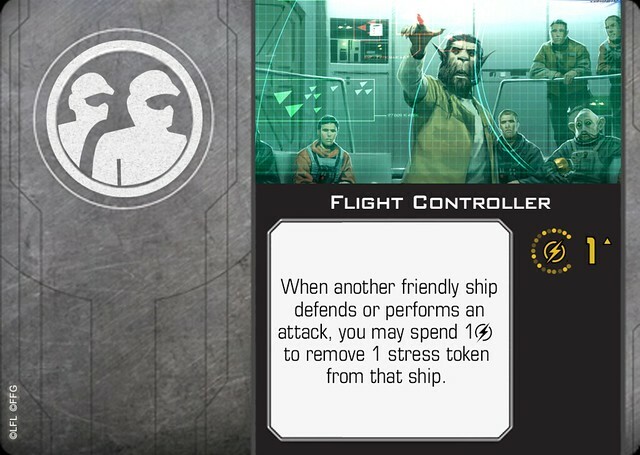 Focus tokens (as well as stress tokens) can represent how the average state of the crew as a whole. 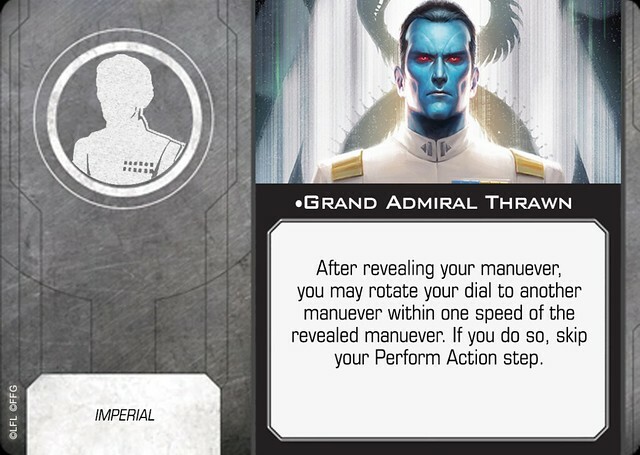 We do not see Ship Cards being representative of a single pilot or driver, but as a representative of the command crew as a whole. 3b. "...governed by stress control...,"? 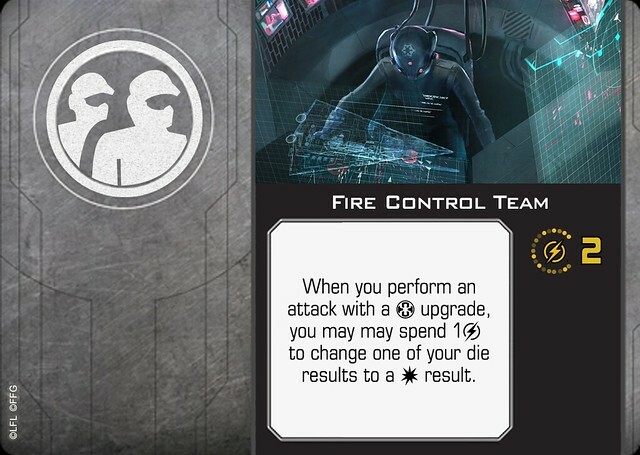 Stress in 2.0 is a mechanic utilized not to govern movement solely, but more primarily action economy. 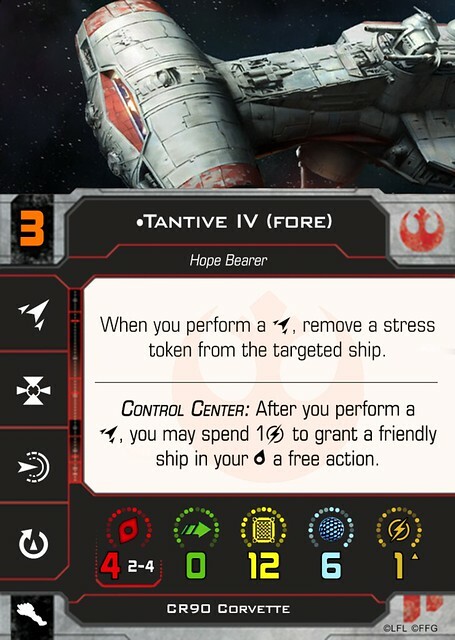 In movement, stress does restrict starfighters from red manuever options while stressed, but this is prevented in huge ships by not giving any of their movement options as red maneuvers. 4. Removing an option simply because it doesn't currently have a use does not warrant removing the possibilities for greater design space. 4a. The Eclipse was a tongue-in-cheek response to the Anime Ship reference. We do not support the idea of a Star Destroyer in X-wing. 5. The Recover Shield option, which you agree by your own statements, is a flawed mechanic that requires alteration. As it is a flawed option, a new mechanic for resource management on huge ships that removes this flawed mechanic does not invalidate the new resource mechanic. Regaining shields in a controlled way via upgrades is already an established mechanic in 2.0, and does not add the layers of complexity that utilizing an additional added mechanic would require, allowing for easier access to the game. Thank you for the compliment on the cards. However, they were not created with Strange Eons. 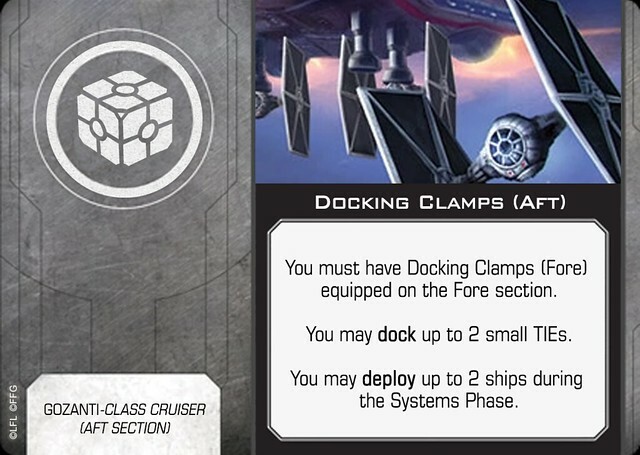 The word space issue was originally a concern, however, thus far we have been able to do it for each of the Huge Ship Aft Section Ship Cards without issue (see images above. Gozanti is still forthcoming, as we are still playing with Title Abilities). I don't think I understand your last statement with the reactor. How would that text read on a card? So no obliques are not going to forgo all forward movement just to go sides. I knew it would be difficult to describe in words so here is a picture I made. I hope it is clear enough. hollow is initial; filled is the final position after a 1 left oblique. For 2a that was when the energy came from the dial. Instead with 2.0 a full energy revision could be taken place where the energy comes from the ship card and the dial takes away charges based upon blips. Yes the complexity was using 1st edition huge ship mechanics but we can adjust the flow of charges/energy to make it more streamlined. So ion pips will not even be needed for 2nd edition. If it is an easy maneuver for the engines say 1 straight then it would have no pips making no lose of charges. You gain charges, reveal dial, exhaust charges and distribute the rest of it. A much simpler flow which is better than scrapping it all together. For calculate and not focus it is more of the vast complexity of the ship and the crew and the ships computers/droids that are working it out. Focus is more of the individual pilot using instinct. It also avoids the slippery slope because calculate stacking won't risk being as broken as focus stacking. 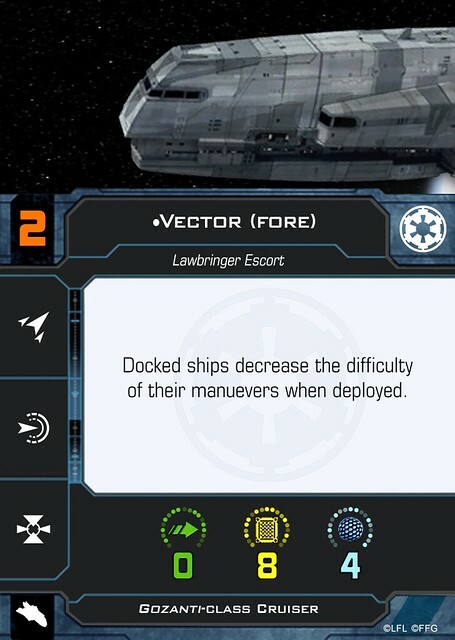 1st edition huge ships tried to do something where they don't get focus but get more rerolls and can modify blank results just to make the attack seem different than from a fighter. It was different but was much weaker. 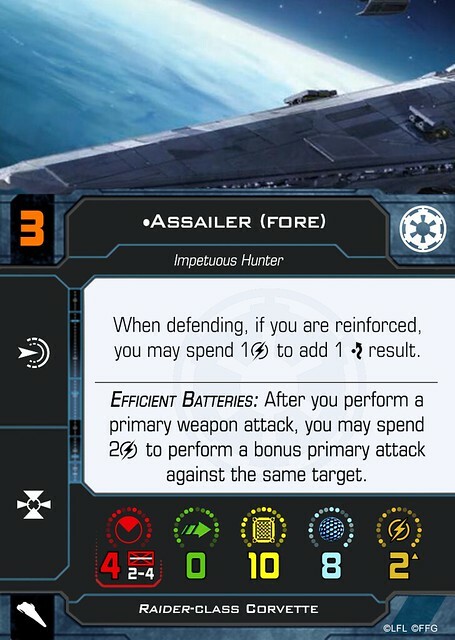 With calculate you could calculate stack and with huge ships have many weapon systems and multiple attacks it would make more sense to give huge ships 2 calculate tokens instead of a single focus token. Sure greater design space but again putting in front of the ship might restrict the design space. Unless you want to use it for ramming. Develop what you want for it. To be honest I don't think the bullseye arc will have much of an effect on standard and due the the even more so fixed movement of 2.0 will likely have less effect on movement planning. Also why not a Star Destroyer? I never said the recover option is flawed (if that were the case huge ships would have never needed all the buffs). That is like saying R2-D2 was broken which only the most cringing of players will swear by. I am just saying that 2.0 has made some design philosophy changes that should be considered when importing epic into 2.0. Recover is a perfectly good action, more often it would be better to do reinforce but if you are pressed then recover is your best action and you will have to figure out how to break from the barrage the net turn or else. 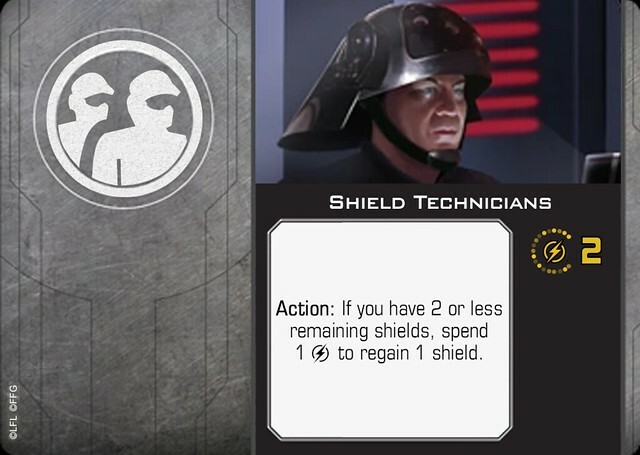 Sure many upgrade cards can now gain charges and regenerate shields off of those charges. Again this is just the need to revisit the energy/charge flow and charge management aspect of huge ships. I understand the reactor, you basically put the energy pips from 1st edition on the ship card which I believe is the right step. However instead of listing every energy gain for each maneuver/bearing/speed it might be better to have a straight up energy gain with maybe a bonus for a certain condition (raider charging weapons/ CR-90 making a straight maneuver) and the dial removes energy based on the engine strain of the maneuver (speed+bearing). 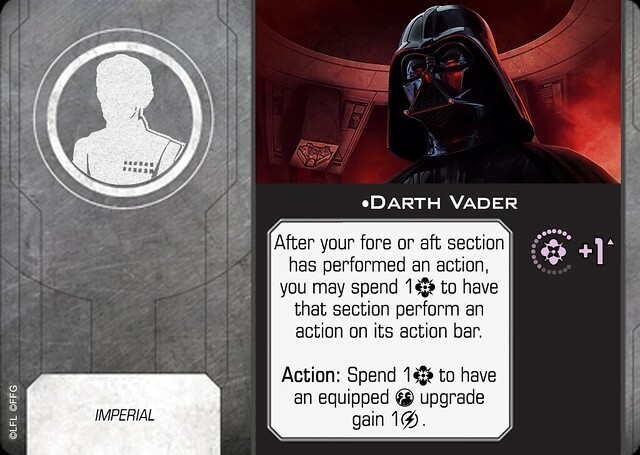 I think the card are good, I think for the most part this is moving to what FFG would do for 2nd edition epic cards. I just think there are some mechanics that are getting lost in translation and are thrown away needlessly. I understand this is a work in progress so just keep it in progress. The obliques that you describe is effectively barrel roll for Huge Ships. There are too numerous amount of issues with that concept for us to implement, not the least of which being overlapping other vessels, vessel position, and avoidance of ships by opponent. Huge ships should not be able to alter their position to that level of degree from their starting position. We agree that Huge Ship dial diversity is lacking in first edition, and are still looking to see what additional changes can be made. Token stacking currently appears to be greatly reduced in 2.0, with an apparent thought to prevent such things from being the norm. We thank you for your input, and do continue to work on our system. However, after multiple playtests, and introductions of the system to newer players, we have so far had great success with the base system that has thus far been constructed. We believe one of the hardest hurdles we will have (and have had with our local group) is the resistance to change from what was previously done, which is the case in any edition change for any game. We present the Gozanti-Class Cruiser! Any input, thoughts, tests, opinions are greatly welcomed. We have found that increasing the Raider's doubleshot to 2 charge cost is much more balancing. Bullseye arc is looking less likely. Rieekan is powerful, possibly too much so with current systems to have him able to repeat his ability. 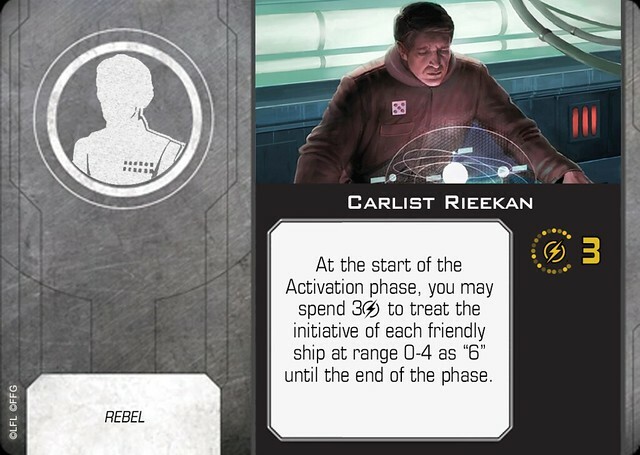 Looking at changes to both Rieekan and Rebel Ships (CR-90 mostly). Well a barrel roll is pretty much a movement, the only difference is it is not tied to a dial setting. Barrel rolls allow you to make a movement after the dial movement and the choice at that time not in the planning phase. Granted if you want to be technical the movement would be equal to 1 huge ship straight and 1 barrel roll. However it wouldn't be any more offsetting than a bank in terms of distance if you take an average of point to point transformation. As for overlapping that is one thing that should be completely revised from 1st edition (maybe a use for those bullseye arcs but on both sides). Well 2.0 change has to be done, I am not resistant to change I just think there could be a better change than removing stuff. 2.0 did a whole lot more than simply remove things, they reinvented turrets, actions, and upgrades as well as list building. It isn't the change I am arguing against it is removing over refining. 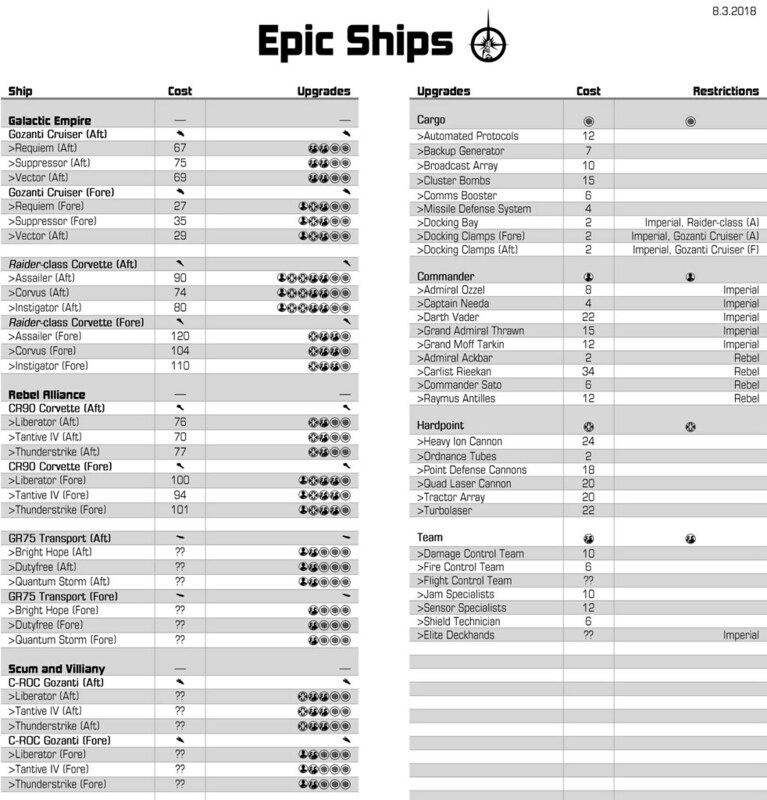 Anyways be sure to look at some of the things added in epic especially after the change to range 4 and 5 (the +2 and +3 green dice), that is when you can see some of the design choices to keep huge ships underpowered working a little too well. The bullseye arc, maybe it shouldn't be just in front. Maybe off the sides or you could make it internal (front to back and sides) as a way to determine if a ship is destroyed by overlapping or simply have its position adjusted to where it is only touching the base. Is there any recommendations for printing? Great job on this!!!!! +1 - this is amazing work. Thanks for sharing! Thanks for posting your epic redo I enjoy reading these posts. Good stuff. Docked ships decrease the difficulty of their manuevers when deployed. 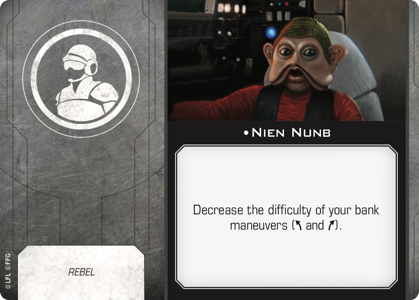 The 'decrease the difficulty' wording is used in cards like Nien Nunb.